The first "Cues for a Cure" tournament began in 2012 in honor of Eddie Venerable, who was diagnosed with stomach cancer. Eddie is the father of John Miller, who is a member of The High Desert Angels. At the time, our group was fundraising for the American Cancer Society and needed a new fundraiser to raise money for our Relay for Life team, Believe It! Eddie's game was billiards and he was amazing at it! He played every opportunity he had and bonded with his son and grandson Shawn over the game. Sadly on October 13, 2012, Eddie was taken from us by cancer. We continued to continued the fundraiser one more year in 2013, however, with life's pressures, we were not able to continue for the next few years. Last year we were able to raise $20,000 and give $2,500 to 8 locals who are battling cancer. We know that this year we can do more, our goal is to raise $24,000! With your help, we can do it! If you know of a family you would like to nominate, please email Angie Miller at HDAngelsNPO@gmail.com. Our tournaments will kick off on September 8th, 2018 at The Rusty Bull in Apple Valley. Events will continue each week until October 20th. All Saturday night events will be at Rusty Bull in Apple Valley and the two Friday events on October 5th and 12th will be at Classic Billiards in Victorville. Each night will be filled with a pool tournament, opportunity drawings, karaoke or band, a spinning wheel and much more. We will also honor a local family who is dealing with cancer, treating them and their family to dinner and a fun filled night. Everyone is welcome to attend the event even if you are not participating in the pool tournament. The entry fee to be in the pool tournament is $20 per person. You don't have to be a great player to participate, you can join for the cause and have some fun! All players must register in person to participate. A few spots will be available to be reserved for the next event after the tournament is over. Entry fees will be taken by cash or check the night of the event you would like to participate in. 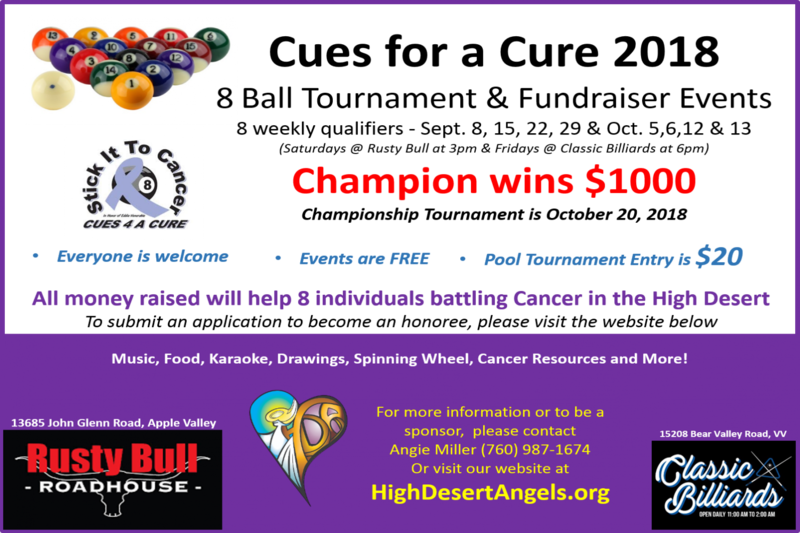 Please write check payable to: High Desert Community Foundation with HD Angels in the memo. We are actively looking for sponsors for our event. If you or anyone you know is interested in being a sponsor, please Click here for more information. If you would like to be a sponsor, vendor or know a family you would like to nominate, please email Angie Miller at HDAngelsNPO@gmail.com. Click here to download the 2018 Honoree Application. For information on the 2017 Cues for a Cure, please click here.